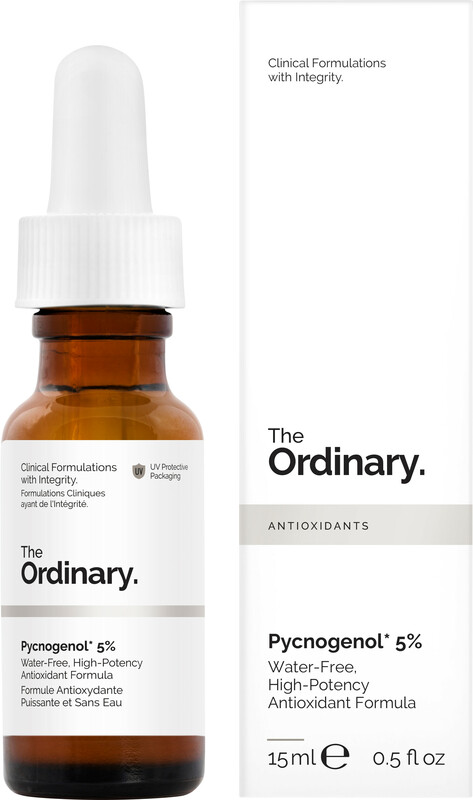 Transform your skin with The Ordinary Pycnogenol 5%, a high-potency, plant-derived antioxidant that will rejuvenate dehydrated and tired looking skin, nourishing it from the inside out. Derived from the pine bark of French maritime pine trees, The Ordinary Pycnogenol 5% contains procyanidins, bioflavonoids and organic acids that help to enhance skin hydration and elasticity. This clever antioxidant can selectively bind to collagen and elastin and protects these proteins from degrading and therefore nourishing the skin from within so that it glows with health on the outside! Pycnogenol will actively seek free radicals before they can cause damage by oxidative stress and is also able to recycle oxidised vitamin C to restore its effectiveness. It absorbs into the skin in just a few minutes and has a deep red colour due to the high procyanidin content. If you’re looking for a product that will improve the tone and texture of your skin as well as smooth out dehydration lines and leaving your complexion looking more smooth and even, this is the perfect solution. With effective results reported on lots of different skin types and skin textures, we can see this being an essential beauty step for many! The Ordinary Pycnogenol 5% can be used morning and night and should be applied alone or after water-based serums but before any oils or heavier creams. Alternatively, you could mix it with other treatments to enhance their antioxidant capacity. It is important to wash your hands after application and avoid contact with fabric as this product can stain. If you’re looking for more ways to keep your complexion smooth, bright and healthy, try pairing Pycnogenol with a product from The Ordinary Vitamin C range. Suitable for beginners and serious skincare addicts, it’s perfect for those looking to tackle dull skin or signs of ageing. Water-free, alcohol-free, fragrance-free, paraben-free, sulphate-free, oil-free, silicone-free, nut-free, gluten-free, cruelty-free.